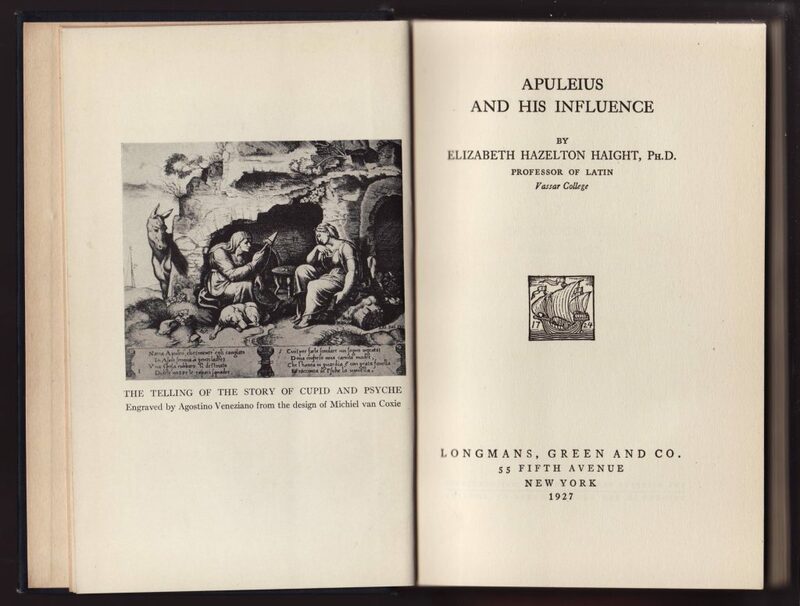 A series of at least 52 titles published beginning in 1922 “dedicated, in the words of its founding editors, to the influence of ‘virtually all the great forces… of the Greek and Roman civilizations upon subsequent life and thought and the extent to which these are interwoven into the fabric of our life to-day. '” (quoted in A Companion to Classical Receptions, 2011). All the titles were most likely written for the series, which was edited by George Depue Hadzsits of the University of Pennsylvania and David Moore Robinson of the Johns Hopkins University. The series was co-published in the US (Marshall Jones, then Longmans, Green) and England (Harrap). Marshall Jones Co. of Boston announced the publication of the series in 1922. Around 1928 several announcements indicate that Longmans, Green & Co. were taking over publication of the series. 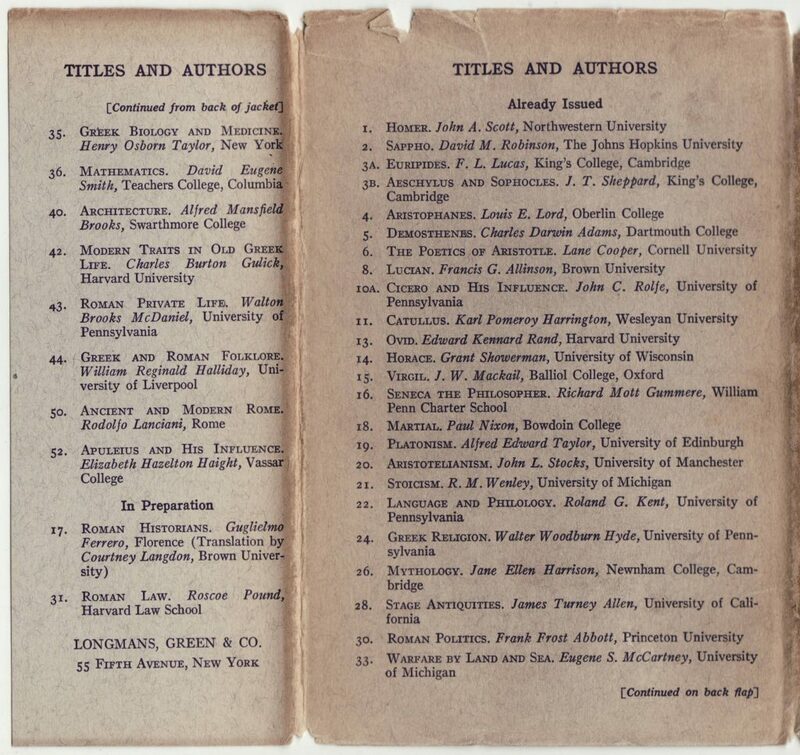 Dates and publisher’s imprints are confusing, with Longmans, Green and Marshall Jones appearing on titles with dates from 1922 to the late 1930s. It is probable that Longmans was issuing already printed titles (with the Marshall Jones imprint). 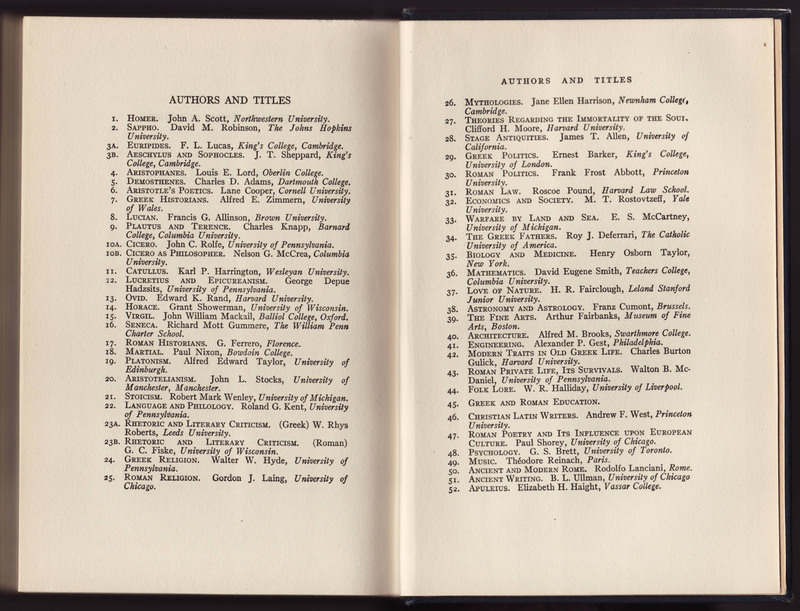 Some titles are listed along with The Plimpton Press (Norwood, Massachusetts) which was a large printer in the Boston region in the 1920s-1960s. There is a trickle of reprints until 1963 when Cooper Square Publishers of New York reissued the series. Cooper Square was a subsidiary of Rowman & Littlefield founded in 1961. It is not clear why two US publishers (Longmans and Marshall Jones) were co-publishing the series in the US beginning in 1922. The jackets for the series (regardless of the publisher) are common to the series, a rather stern design which does have a varying illustration centered on the jacket. 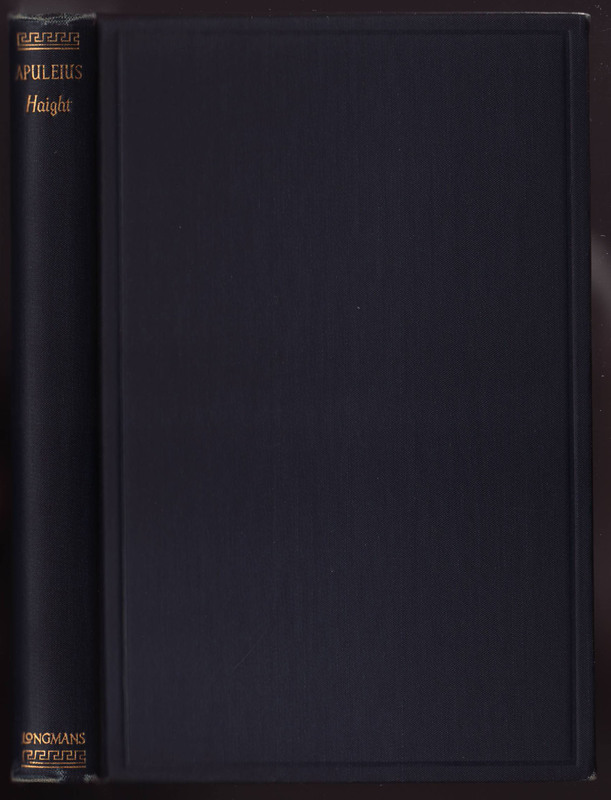 The series name is included on the spine, along with the series number. The series name and editors fill the top section of the jacket front. The publisher (Longmans, Marshall Jones, Harrap) appears in the bottom section of the jacket. 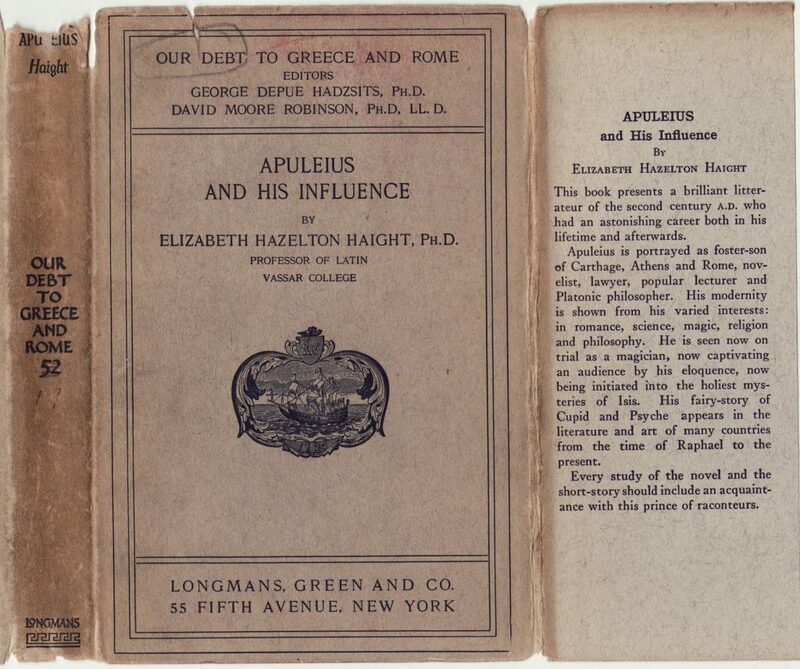 The front jacket flap summarizes the title, in this case, Apuletus and his Influence by Elizabeth Hazelton Haight. This title was published in 1927, the 52nd title in the series and carries the Longmans imprint. The rear jacket and jacket flat list titles in the series, up through this particular title, #52. Oddly, there are several serial numbers shared by two books, such as 3a (Euripides) and 3b (Aeschylus & Sophocles), 10a (Cicero) and 10b (Cicero as Philosopher), 24a and 24b (Rhetoric, Greek and Roman). It seems as if these were related titles issued with the same serial number. Bindings are cloth, dark blue with minimal gold decorations and typography. A debossed rectangle surrounds the front cover. 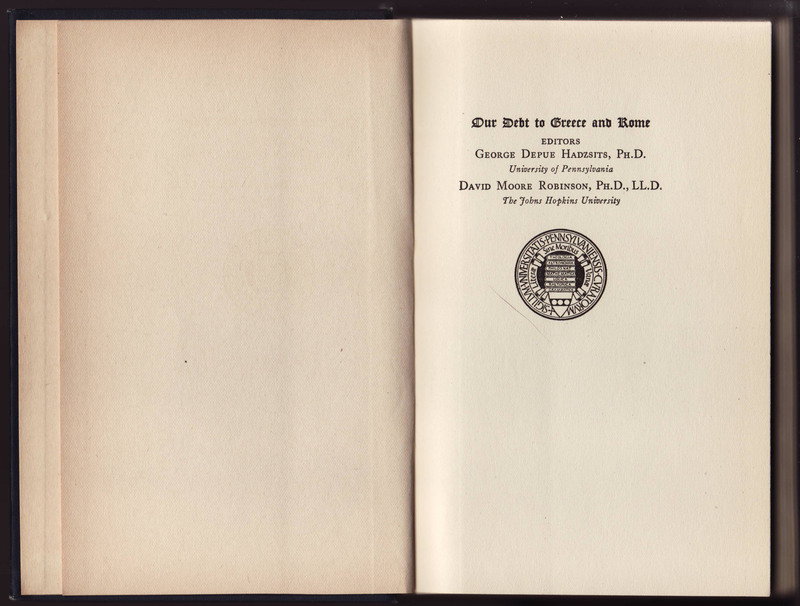 The half title page includes the series name and editors and the seal of the University of Pennsylvania (it is possible that the series was subsidized by the University). 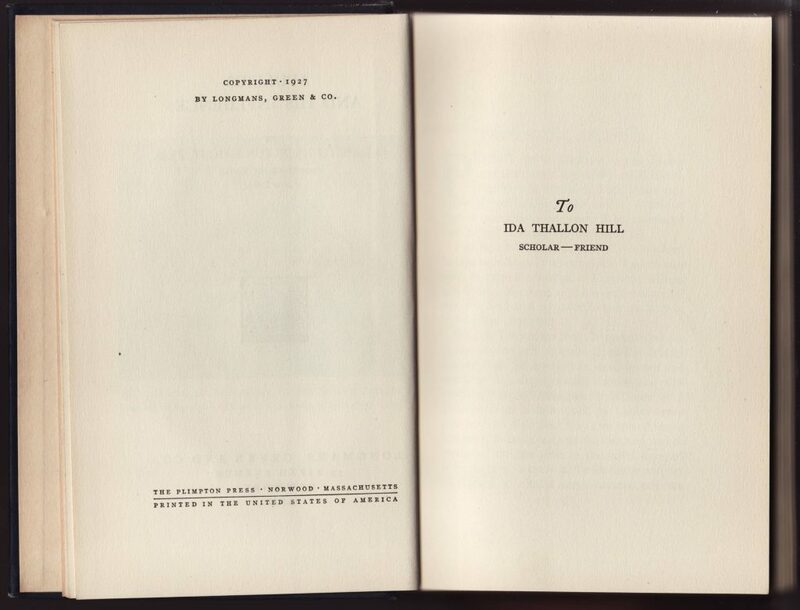 A frontispiece faces the title page, which includes, under the publisher’s imprint, the date of publication (1927). The copyright page includes the date and publisher. The Plimpton Press (Norwood, Massachusetts) is the printer. It appears that Plimpton printed the books for both Longmans and Marshall Jones (again, it’s not clear why two US publishers would be selling these books simultaneously). 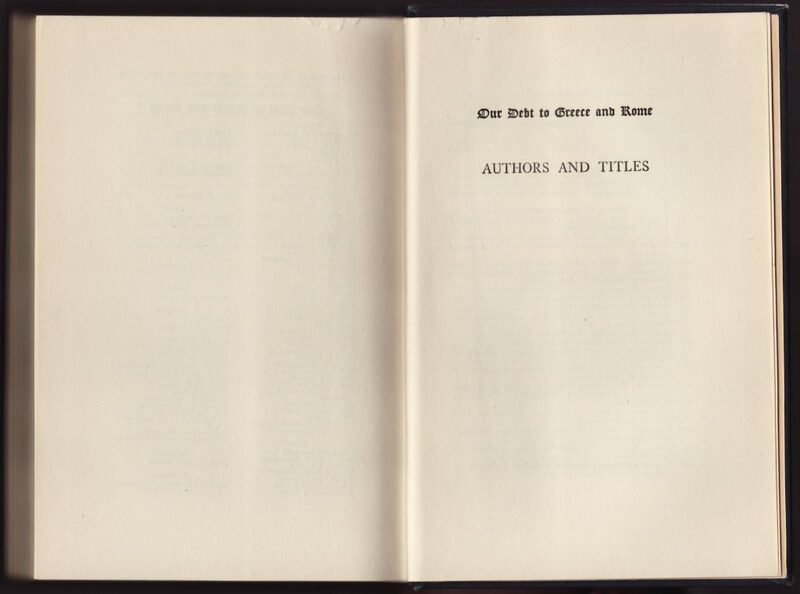 A catalog of the series’ titles is appended to the back of the book, spread over two pages. The series had reached 52 titles at this point, with three double volumes.